TAMPA, FL. -- Members of Coastal Wealth attended Unsigned Preps’ 3rd Annual Dinner and Fundraiser February 23, 2018 at the Centre Club in Tampa, raising more than $20,000, to support student athletes for their academic and community service efforts. Money raised will also support Unsigned Preps’ events and outreach programs. Unsigned Prep was founded in 2010, designed to provide a path to help high school student athletes make it to college. The non-profit organization whose motto is, “My desire is greater than my talent,” is dedicated to creating opportunities to maximize students’ potential to become well-rounded leaders, communicators and teammates. Corey Dean, Coastal Wealth’s Associate Manager, attended the fundraiser with his team as Unsigned Preps’ lead sponsor. Coastal Wealth’s Sports & Entertainment division attends Unsigned Preps’ 3rd Annual Fundraiser, Saturday, February 23, 2018. 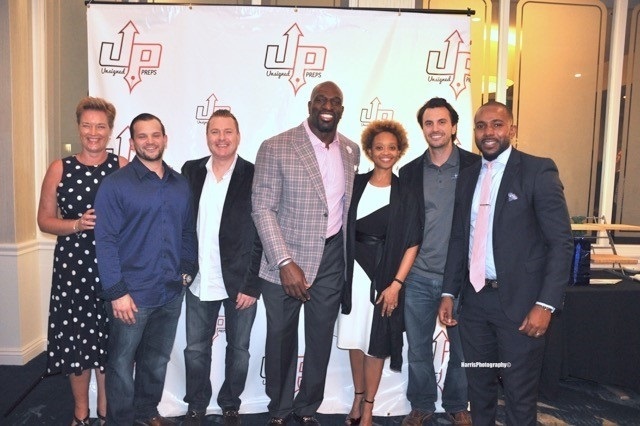 Pictured left to right: Trine Andersen, Andrew Price, Jason Montgomery, Titus O’Neill, Girlfriend, Christopher Price, Corey Dean. Dean developed Coastal Wealth’s sports and entertainment division along with Andrew Price, Christopher Price, Ben Lasater, Quadtrine Hill and Jason Montgomery. The team provides risk management for athletes and business owners, as well as tax advantage strategies. They are dedicated to helping their clients protect the futures they’ve dreamed of and planned for, helping them to understand and oversee their own financial planning. Founded in 1851, MassMutual is a leading mutual life insurance company that is run for the benefit of its members and participating policyowners. The company has a long history of financial strength and strong performance, and although dividends are not guaranteed, MassMutual has paid dividends to eligible participating policyowners consistently since the 1860s. With whole life insurance as its foundation, MassMutual provides products to help meet the financial needs of clients, such as life insurance, disability income insurance, long term care insurance, retirement/401(k) plan services, and annuities. In addition, the company’s strong and growing network of financial professionals helps clients make good financial decisions for the long-term. MassMutual Financial Group is a marketing name for Massachusetts Mutual Life Insurance Company (MassMutual) and its affiliated companies and sales representatives. Securities, investment advisory and financial planning services offered through qualified registered representatives of MML Investors Services, LLC. Member SIPC. OSJ: 2400 E Commercial Blvd., 11th Floor, Ft. Lauderdale, FL 33308. (800)320-4180. CRN202003-227505.